As a result of technical changes, Valve's Steam game store and launcher will no longer work on Yosemite or any older versions of macOS beginning Jan. 1. New Steam features depend on an embedded version of Google's Chrome Web browser, which isn't compatible with the earlier macOS releases, Valve explained. Upcoming versions of Steam will also require features and security only found in macOS El Capitan and later. Steam should continue to work on Yosemite for the rest of December, but even then some functions will be unavailable, such as Steam Chat. 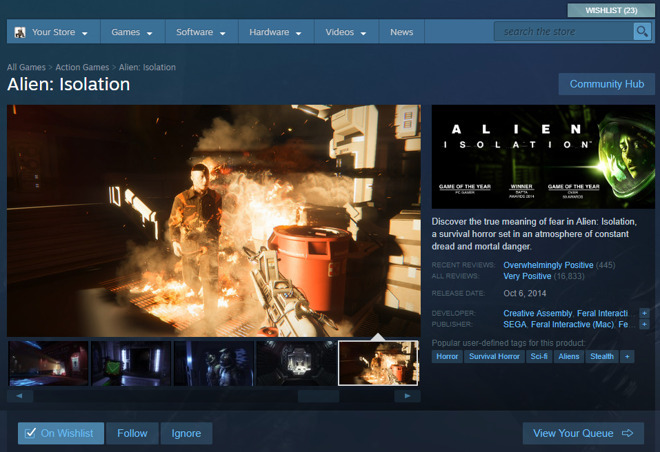 Steam is often considered a de facto platform for computer gaming, thanks to broad developer/publisher support and cross-platform compatibility, including not just Mac and Windows but Linux as well. Though new stores like Discord's and the Epic Game Store could potentially upset Valve's hegemony, they face an uphill battle given the large Steam libraries many gamers have. Apple's own Mac App Store has had lukewarm support from the games industry. The service is of course Mac-only, and Apple claims a 30 percent cut from sales. Unlike the iOS App Store, Mac game makers can choose to sell direct to the consumer or through whatever storefront offers the best deal. Steam still supports Windows 7 through 10, and Ubuntu Linux. AppleInsider strongly recommends upgrading compatible hardware to newer versions of macOS if available. However, older hardware that are getting left behind by the depreciation of the older Google Chrome embedded browser can still use Steam libraries under Boot Camp.